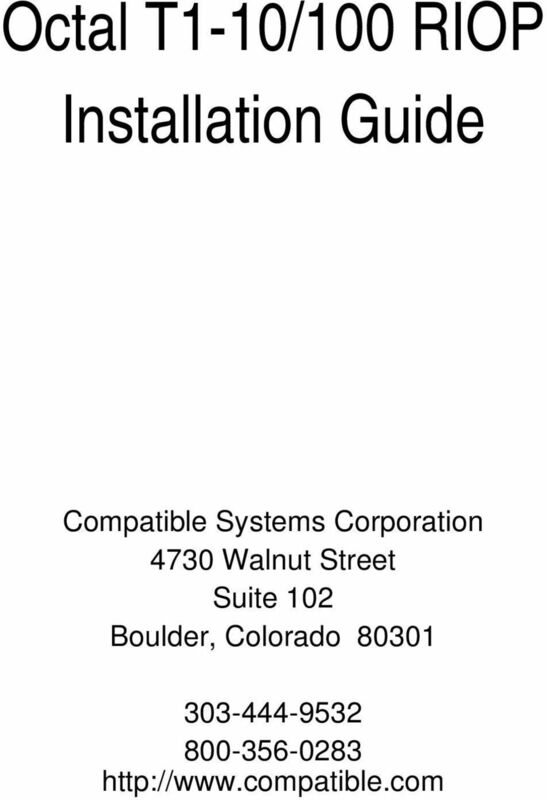 Download "Octal T1-10/100 RIOP Installation Guide"
2 Octal T1-10/100 RIOP Installation Guide, Version 1.0 Copyright 1999, Compatible Systems Corporation All rights reserved. VSR, VSR-2, MicroRouter and CompatiView are trademarks of Compatible Systems Corporation. Other trademarks are the property of their respective holders. FCC Notice: This product has been certified to comply with the limits for a Class A computing device, pursuant to Subpart J of Part 15 of FCC Rules. It is designed to provide reasonable protection against radio or television communication interference in a commercial environment. Operation of this equipment in a residential area could cause interference with radio or television communication. 5 Introduction to the Octal T1-10/100 RIOP 1 Introduction to the Octal T1-10/100 RIOP The Octal T1-10/100 Routing Input/Output Processor (RIOP), as part of the VSR multigigabit switching router, allows you to connect a local Ethernet and up to eight remote corporate networks. Each of the T1 interfaces has a data capacity of Mbps, while the Ethernet interface can operate at either 10 Mbps or 100 Mbps. 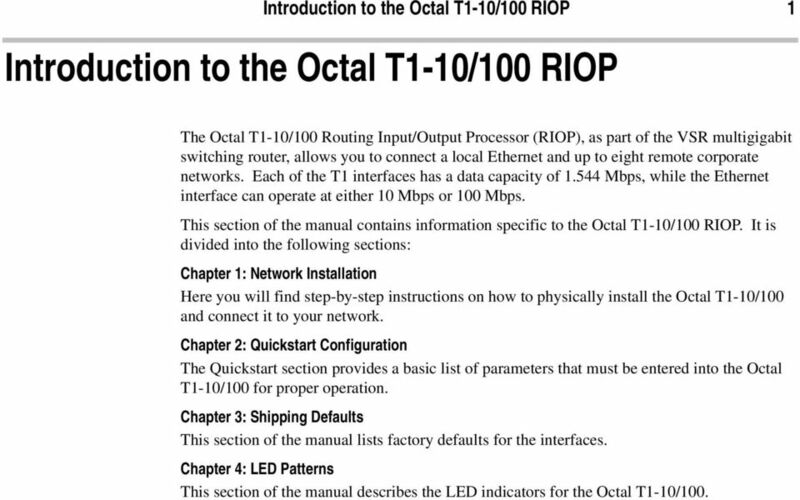 This section of the manual contains information specific to the Octal T1-10/100 RIOP. 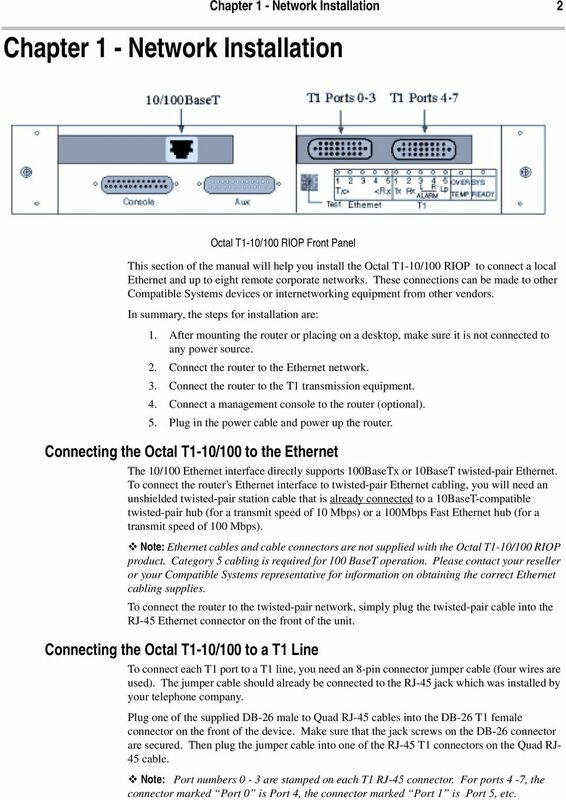 It is divided into the following sections: Chapter 1: Network Installation Here you will find step-by-step instructions on how to physically install the Octal T1-10/100 and connect it to your network. Chapter 2: Quickstart Configuration The Quickstart section provides a basic list of parameters that must be entered into the Octal T1-10/100 for proper operation. 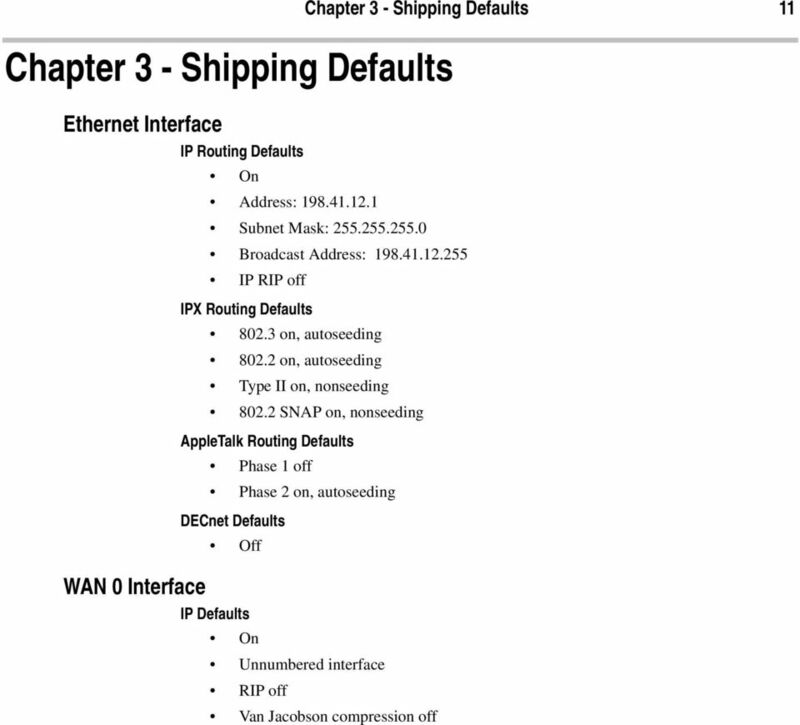 Chapter 3: Shipping Defaults This section of the manual lists factory defaults for the interfaces. Chapter 4: LED Patterns This section of the manual describes the LED indicators for the Octal T1-10/100. 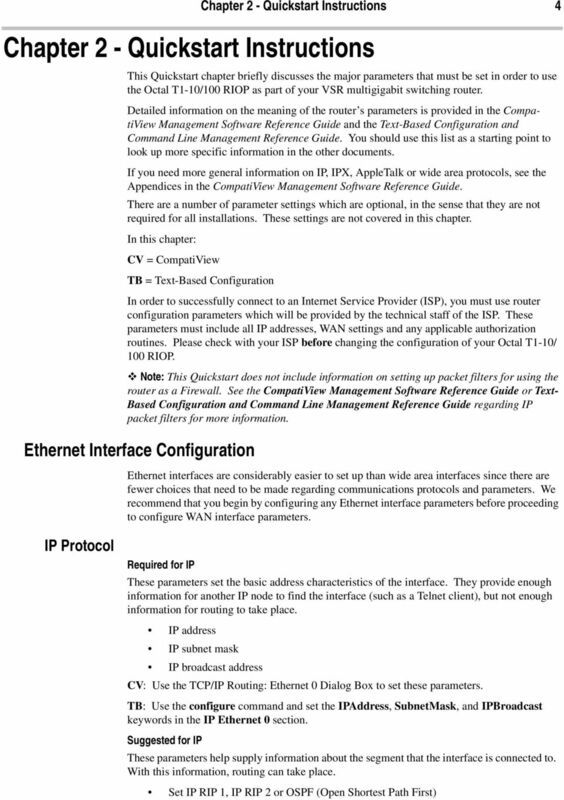 6 Chapter 1 - Network Installation Chapter 1 - Network Installation 2 Octal T1-10/100 RIOP Front Panel This section of the manual will help you install the Octal T1-10/100 RIOP to connect a local Ethernet and up to eight remote corporate networks. These connections can be made to other Compatible Systems devices or internetworking equipment from other vendors. In summary, the steps for installation are: 1. After mounting the router or placing on a desktop, make sure it is not connected to any power source. 2. Connect the router to the Ethernet network. 3. Connect the router to the T1 transmission equipment. 4. Connect a management console to the router (optional). 5. Plug in the power cable and power up the router. Connecting the Octal T1-10/100 to the Ethernet The 10/100 Ethernet interface directly supports 100BaseTx or 10BaseT twisted-pair Ethernet. To connect the router s Ethernet interface to twisted-pair Ethernet cabling, you will need an unshielded twisted-pair station cable that is already connected to a 10BaseT-compatible twisted-pair hub (for a transmit speed of 10 Mbps) or a 100Mbps Fast Ethernet hub (for a transmit speed of 100 Mbps). v Note: Ethernet cables and cable connectors are not supplied with the Octal T1-10/100 RIOP product. Category 5 cabling is required for 100 BaseT operation. Please contact your reseller or your Compatible Systems representative for information on obtaining the correct Ethernet cabling supplies. To connect the router to the twisted-pair network, simply plug the twisted-pair cable into the RJ-45 Ethernet connector on the front of the unit. Connecting the Octal T1-10/100 to a T1 Line To connect each T1 port to a T1 line, you need an 8-pin connector jumper cable (four wires are used). The jumper cable should already be connected to the RJ-45 jack which was installed by your telephone company. Plug one of the supplied DB-26 male to Quad RJ-45 cables into the DB-26 T1 female connector on the front of the device. Make sure that the jack screws on the DB-26 connector are secured. Then plug the jumper cable into one of the RJ-45 T1 connectors on the Quad RJ- 45 cable. v Note: Port numbers 0-3 are stamped on each T1 RJ-45 connector. For ports 4-7, the connector marked Port 0 is Port 4, the connector marked Port 1 is Port 5, etc. 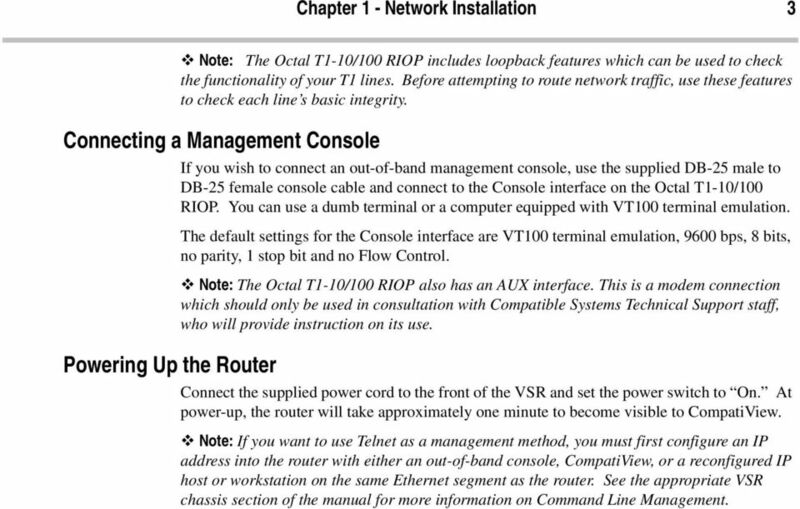 7 Chapter 1 - Network Installation 3 v Note: The Octal T1-10/100 RIOP includes loopback features which can be used to check the functionality of your T1 lines. Before attempting to route network traffic, use these features to check each line s basic integrity. Connecting a Management Console Powering Up the Router If you wish to connect an out-of-band management console, use the supplied DB-25 male to DB-25 female console cable and connect to the Console interface on the Octal T1-10/100 RIOP. You can use a dumb terminal or a computer equipped with VT100 terminal emulation. The default settings for the Console interface are VT100 terminal emulation, 9600 bps, 8 bits, no parity, 1 stop bit and no Flow Control. v Note: The Octal T1-10/100 RIOP also has an AUX interface. This is a modem connection which should only be used in consultation with Compatible Systems Technical Support staff, who will provide instruction on its use. Connect the supplied power cord to the front of the VSR and set the power switch to On. At power-up, the router will take approximately one minute to become visible to CompatiView. v Note: If you want to use Telnet as a management method, you must first configure an IP address into the router with either an out-of-band console, CompatiView, or a reconfigured IP host or workstation on the same Ethernet segment as the router. See the appropriate VSR chassis section of the manual for more information on Command Line Management. 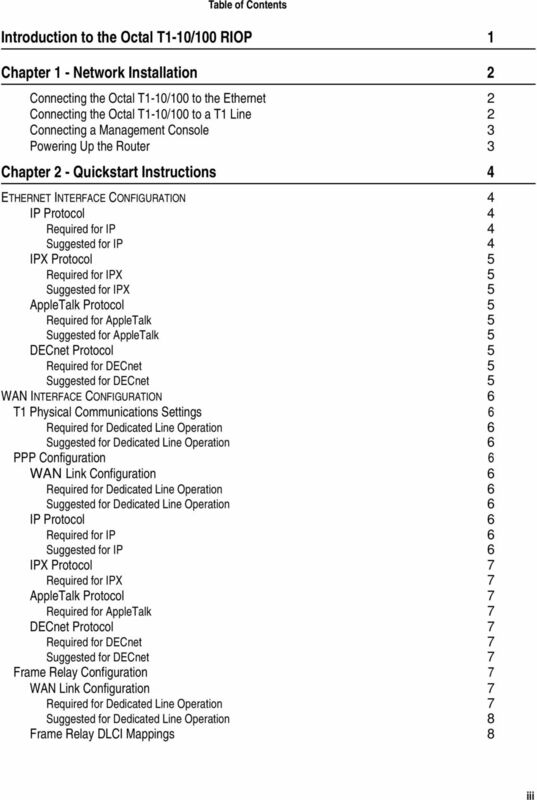 9 Chapter 2 - Quickstart Instructions 5 IPX Protocol AppleTalk Protocol DECnet Protocol IP static routes CV: Use the TCP/IP Routing: Ethernet 0 Dialog Box to set RIP, and the IP Static Routing Dialog Box (under Global/IP Static Routes) to set static routes. OSPF can only be configured using text-based configuration. TB: Use configure and set either the RIPVersion keyword or the OSPFEnabled keyword for the IP Ethernet 0 section. Use edit config and add static routes in the IP Static section. Required for IPX Generally, there are no required changes from the shipping Ethernet configuration for IPX. The Ethernet interface will autoconfigure to use the two most common IPX frame types, and will adapt to conditions on the Ethernet. Suggested for IPX You may want to set your own network numbers, rather than using the autoconfigured values. You may also want to turn off unused frame types. CV: Use the IPX Routing: Ethernet 0 Dialog Box. TB: Use configure and set keywords in the IPX Ethernet 0 section. 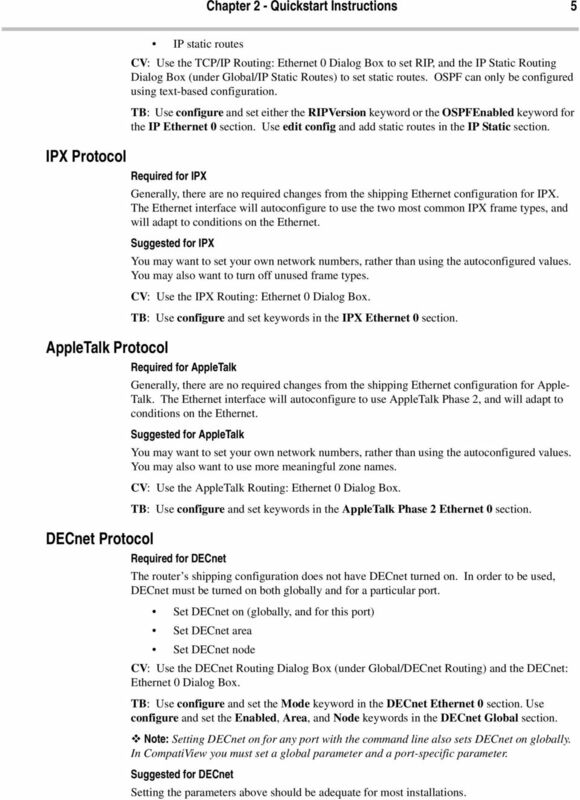 Required for AppleTalk Generally, there are no required changes from the shipping Ethernet configuration for Apple- Talk. The Ethernet interface will autoconfigure to use AppleTalk Phase 2, and will adapt to conditions on the Ethernet. Suggested for AppleTalk You may want to set your own network numbers, rather than using the autoconfigured values. You may also want to use more meaningful zone names. CV: Use the AppleTalk Routing: Ethernet 0 Dialog Box. TB: Use configure and set keywords in the AppleTalk Phase 2 Ethernet 0 section. 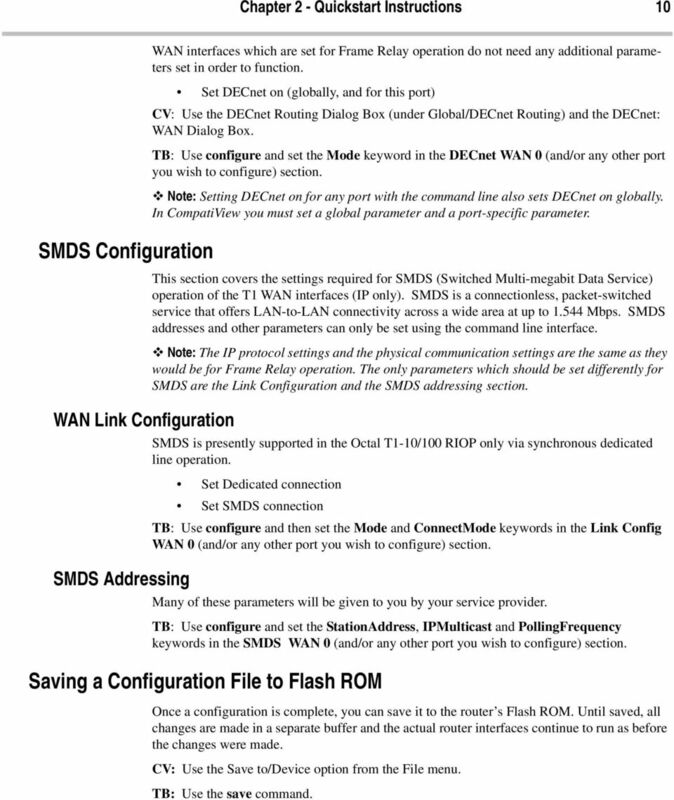 Required for DECnet The router s shipping configuration does not have DECnet turned on. In order to be used, DECnet must be turned on both globally and for a particular port. Set DECnet on (globally, and for this port) Set DECnet area Set DECnet node CV: Use the DECnet Routing Dialog Box (under Global/DECnet Routing) and the DECnet: Ethernet 0 Dialog Box. TB: Use configure and set the Mode keyword in the DECnet Ethernet 0 section. Use configure and set the Enabled, Area, and Node keywords in the DECnet Global section. v Note: Setting DECnet on for any port with the command line also sets DECnet on globally. In CompatiView you must set a global parameter and a port-specific parameter. Suggested for DECnet Setting the parameters above should be adequate for most installations. 10 Chapter 2 - Quickstart Instructions 6 WAN Interface Configuration The default setting for all WAN interfaces on your Octal T1-10/100 RIOP is Off for all protocols and for the link configuration. In order to use a WAN interface, you may first need to set some physical parameters and then set up the link and protocol parameters. T1 Physical Communications Settings PPP Configuration WAN Link Configuration Required for Dedicated Line Operation No changes from the default values are required for standard operation over a T1 line. The default values are listed in Chapter 3. Suggested for Dedicated Line Operation Changing to fractional T1, different coding or framing, etc., may be required for a particular installation. CV: Use the Physical Configuration: WAN Dialog Box. TB: Use configure and the T1 Interface WAN 0 (and/or any other port you wish to configure) section. 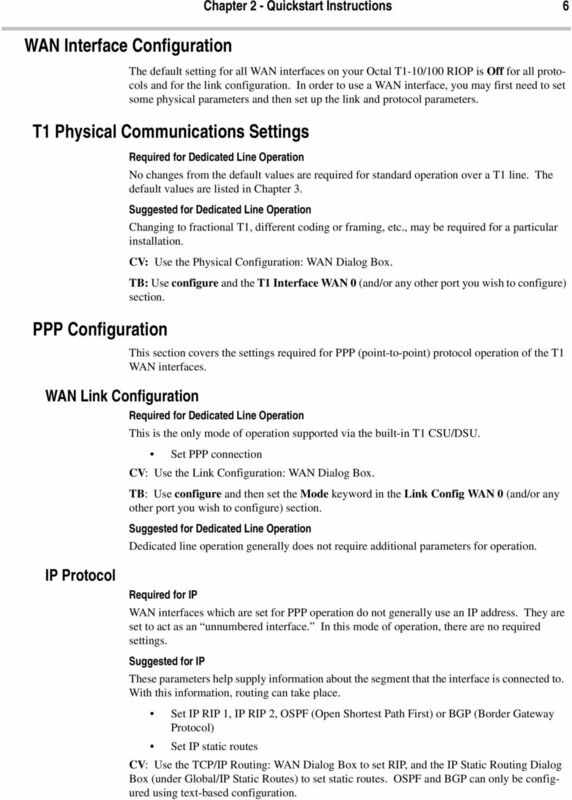 This section covers the settings required for PPP (point-to-point) protocol operation of the T1 WAN interfaces. Required for Dedicated Line Operation This is the only mode of operation supported via the built-in T1 CSU/DSU. Set PPP connection CV: Use the Link Configuration: WAN Dialog Box. TB: Use configure and then set the Mode keyword in the Link Config WAN 0 (and/or any other port you wish to configure) section. Suggested for Dedicated Line Operation Dedicated line operation generally does not require additional parameters for operation. IP Protocol Required for IP WAN interfaces which are set for PPP operation do not generally use an IP address. They are set to act as an unnumbered interface. In this mode of operation, there are no required settings. Suggested for IP These parameters help supply information about the segment that the interface is connected to. With this information, routing can take place. Set IP RIP 1, IP RIP 2, OSPF (Open Shortest Path First) or BGP (Border Gateway Protocol) Set IP static routes CV: Use the TCP/IP Routing: WAN Dialog Box to set RIP, and the IP Static Routing Dialog Box (under Global/IP Static Routes) to set static routes. OSPF and BGP can only be configured using text-based configuration. 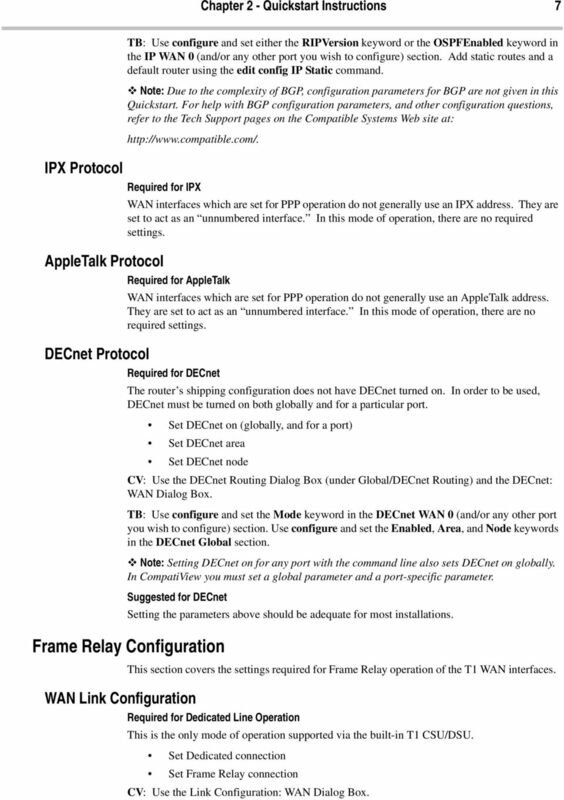 11 Chapter 2 - Quickstart Instructions 7 IPX Protocol AppleTalk Protocol DECnet Protocol TB: Use configure and set either the RIPVersion keyword or the OSPFEnabled keyword in the IP WAN 0 (and/or any other port you wish to configure) section. Add static routes and a default router using the edit config IP Static command. v Note: Due to the complexity of BGP, configuration parameters for BGP are not given in this Quickstart. For help with BGP configuration parameters, and other configuration questions, refer to the Tech Support pages on the Compatible Systems Web site at: Required for IPX WAN interfaces which are set for PPP operation do not generally use an IPX address. They are set to act as an unnumbered interface. In this mode of operation, there are no required settings. 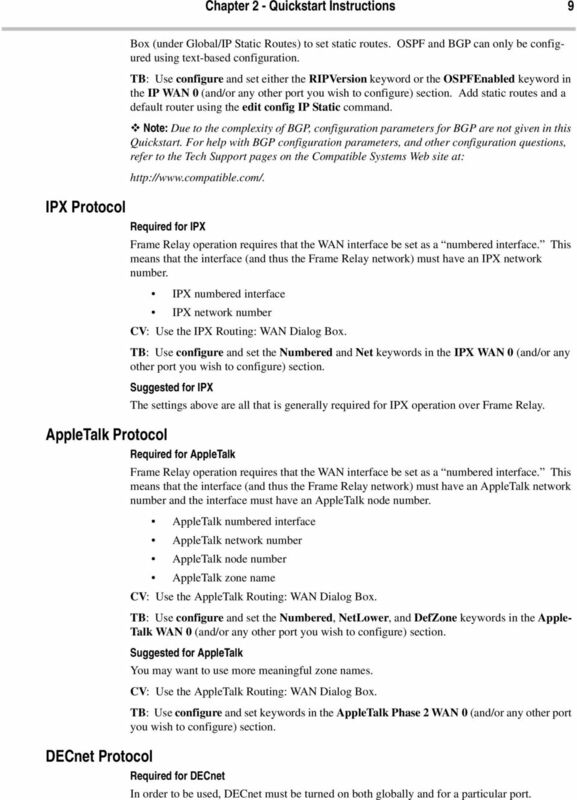 Required for AppleTalk WAN interfaces which are set for PPP operation do not generally use an AppleTalk address. They are set to act as an unnumbered interface. In this mode of operation, there are no required settings. Required for DECnet The router s shipping configuration does not have DECnet turned on. In order to be used, DECnet must be turned on both globally and for a particular port. Set DECnet on (globally, and for a port) Set DECnet area Set DECnet node CV: Use the DECnet Routing Dialog Box (under Global/DECnet Routing) and the DECnet: WAN Dialog Box. TB: Use configure and set the Mode keyword in the DECnet WAN 0 (and/or any other port you wish to configure) section. Use configure and set the Enabled, Area, and Node keywords in the DECnet Global section. v Note: Setting DECnet on for any port with the command line also sets DECnet on globally. In CompatiView you must set a global parameter and a port-specific parameter. Suggested for DECnet Setting the parameters above should be adequate for most installations. 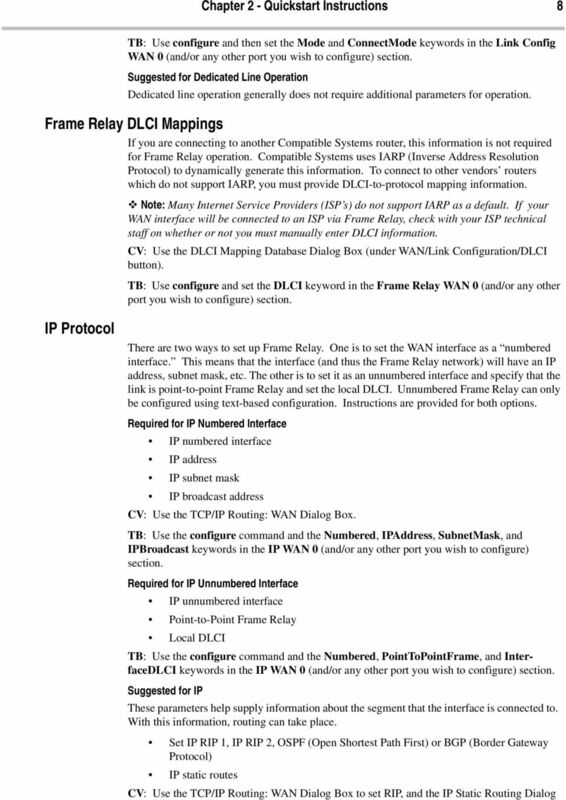 Frame Relay Configuration WAN Link Configuration This section covers the settings required for Frame Relay operation of the T1 WAN interfaces. Required for Dedicated Line Operation This is the only mode of operation supported via the built-in T1 CSU/DSU. Set Dedicated connection Set Frame Relay connection CV: Use the Link Configuration: WAN Dialog Box. 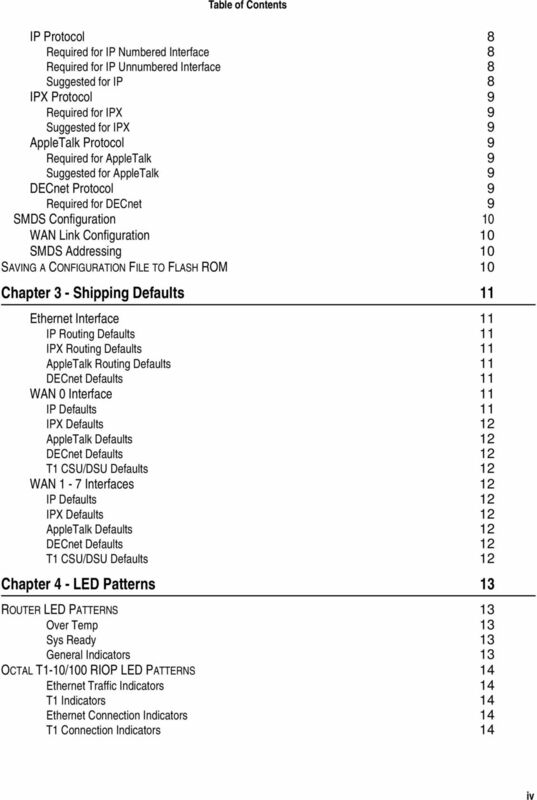 13 Chapter 2 - Quickstart Instructions 9 IPX Protocol AppleTalk Protocol DECnet Protocol Box (under Global/IP Static Routes) to set static routes. OSPF and BGP can only be configured using text-based configuration. TB: Use configure and set either the RIPVersion keyword or the OSPFEnabled keyword in the IP WAN 0 (and/or any other port you wish to configure) section. Add static routes and a default router using the edit config IP Static command. v Note: Due to the complexity of BGP, configuration parameters for BGP are not given in this Quickstart. For help with BGP configuration parameters, and other configuration questions, refer to the Tech Support pages on the Compatible Systems Web site at: Required for IPX Frame Relay operation requires that the WAN interface be set as a numbered interface. This means that the interface (and thus the Frame Relay network) must have an IPX network number. IPX numbered interface IPX network number CV: Use the IPX Routing: WAN Dialog Box. TB: Use configure and set the Numbered and Net keywords in the IPX WAN 0 (and/or any other port you wish to configure) section. Suggested for IPX The settings above are all that is generally required for IPX operation over Frame Relay. Required for AppleTalk Frame Relay operation requires that the WAN interface be set as a numbered interface. This means that the interface (and thus the Frame Relay network) must have an AppleTalk network number and the interface must have an AppleTalk node number. AppleTalk numbered interface AppleTalk network number AppleTalk node number AppleTalk zone name CV: Use the AppleTalk Routing: WAN Dialog Box. TB: Use configure and set the Numbered, NetLower, and DefZone keywords in the Apple- Talk WAN 0 (and/or any other port you wish to configure) section. Suggested for AppleTalk You may want to use more meaningful zone names. CV: Use the AppleTalk Routing: WAN Dialog Box. TB: Use configure and set keywords in the AppleTalk Phase 2 WAN 0 (and/or any other port you wish to configure) section. Required for DECnet In order to be used, DECnet must be turned on both globally and for a particular port. 14 Chapter 2 - Quickstart Instructions 10 SMDS Configuration WAN Link Configuration SMDS Addressing WAN interfaces which are set for Frame Relay operation do not need any additional parameters set in order to function. Set DECnet on (globally, and for this port) CV: Use the DECnet Routing Dialog Box (under Global/DECnet Routing) and the DECnet: WAN Dialog Box. TB: Use configure and set the Mode keyword in the DECnet WAN 0 (and/or any other port you wish to configure) section. v Note: Setting DECnet on for any port with the command line also sets DECnet on globally. In CompatiView you must set a global parameter and a port-specific parameter. This section covers the settings required for SMDS (Switched Multi-megabit Data Service) operation of the T1 WAN interfaces (IP only). SMDS is a connectionless, packet-switched service that offers LAN-to-LAN connectivity across a wide area at up to Mbps. SMDS addresses and other parameters can only be set using the command line interface. v Note: The IP protocol settings and the physical communication settings are the same as they would be for Frame Relay operation. The only parameters which should be set differently for SMDS are the Link Configuration and the SMDS addressing section. SMDS is presently supported in the Octal T1-10/100 RIOP only via synchronous dedicated line operation. Set Dedicated connection Set SMDS connection TB: Use configure and then set the Mode and ConnectMode keywords in the Link Config WAN 0 (and/or any other port you wish to configure) section. Many of these parameters will be given to you by your service provider. TB: Use configure and set the StationAddress, IPMulticast and PollingFrequency keywords in the SMDS WAN 0 (and/or any other port you wish to configure) section. Saving a Configuration File to Flash ROM Once a configuration is complete, you can save it to the router s Flash ROM. Until saved, all changes are made in a separate buffer and the actual router interfaces continue to run as before the changes were made. CV: Use the Save to/device option from the File menu. TB: Use the save command. 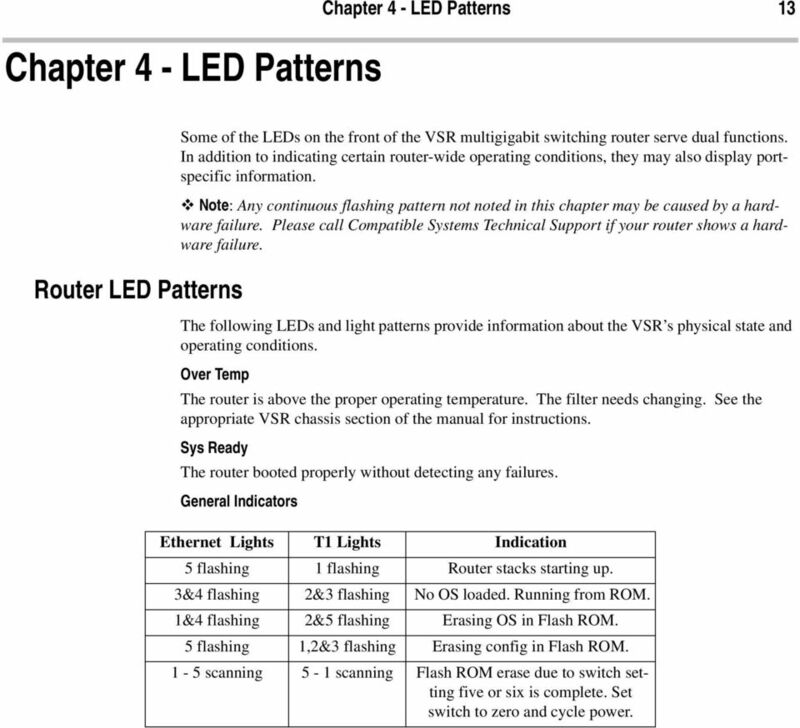 17 Chapter 4 - LED Patterns Chapter 4 - LED Patterns 13 Router LED Patterns Some of the LEDs on the front of the VSR multigigabit switching router serve dual functions. In addition to indicating certain router-wide operating conditions, they may also display portspecific information. v Note: Any continuous flashing pattern not noted in this chapter may be caused by a hardware failure. Please call Compatible Systems Technical Support if your router shows a hardware failure. The following LEDs and light patterns provide information about the VSR s physical state and operating conditions. Over Temp The router is above the proper operating temperature. The filter needs changing. See the appropriate VSR chassis section of the manual for instructions. Sys Ready The router booted properly without detecting any failures. General Indicators Ethernet Lights T1 Lights Indication 5 flashing 1 flashing Router stacks starting up. 3&4 flashing 2&3 flashing No OS loaded. Running from ROM. 1&4 flashing 2&5 flashing Erasing OS in Flash ROM. 5 flashing 1,2&3 flashing Erasing config in Flash ROM. 1-5 scanning 5-1 scanning Flash ROM erase due to switch setting five or six is complete. Set switch to zero and cycle power. 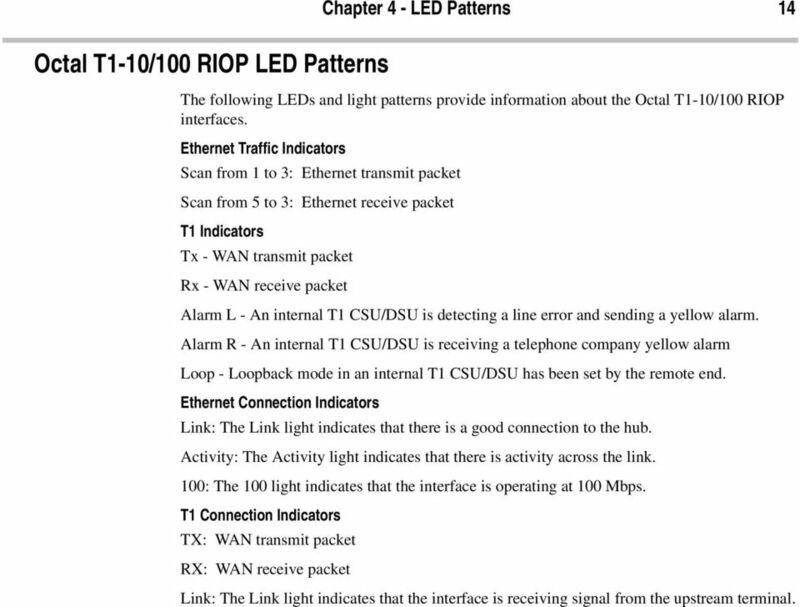 18 Octal T1-10/100 RIOP LED Patterns Chapter 4 - LED Patterns 14 The following LEDs and light patterns provide information about the Octal T1-10/100 RIOP interfaces. Ethernet Traffic Indicators Scan from 1 to 3: Ethernet transmit packet Scan from 5 to 3: Ethernet receive packet T1 Indicators Tx - WAN transmit packet Rx - WAN receive packet Alarm L - An internal T1 CSU/DSU is detecting a line error and sending a yellow alarm. Alarm R - An internal T1 CSU/DSU is receiving a telephone company yellow alarm Loop - Loopback mode in an internal T1 CSU/DSU has been set by the remote end. Ethernet Connection Indicators Link: The Link light indicates that there is a good connection to the hub. Activity: The Activity light indicates that there is activity across the link. 100: The 100 light indicates that the interface is operating at 100 Mbps. T1 Connection Indicators TX: WAN transmit packet RX: WAN receive packet Link: The Link light indicates that the interface is receiving signal from the upstream terminal. WANs and Routers M.Sc. Aleksandra Kanevce M.Sc. Aleksandra Bogojeska 1 Introduction to WANs A WAN is a data communications network that spans a large geographic area such as a state, province, or country. WANPIPE TM Multi-protocol WANPIPE Driver CONFIGURATION M A N U A L Author: Nenad Corbic/Alex Feldman Copyright (c) 1995-2002 Sangoma Technologies Inc. Introduction WANPIPE from Sangoma Technologies Inc.
FSW-0505TX/0805TX 5/8 Port SOHO 10/100Mbps NWay Switch FSW-0505TX FSW-0805TX. 5/8 Port SOHO 10/100Mbps NWay Switch. User s Manual. (Revision 1. This techno knowledge paper can help you if: You need to setup a WAN connection between a Patton Router and a NetGuardian. Unpacking the Product. Rack Installation. Then, use the screws provided with the equipment rack to mount the firewall in the rack. Legal Disclaimers. For C-UL Listed applications, the unit shall be installed in accordance with Part 1 of the Canadian Electrical Code. Chapter 4 T1 Interface Card GENERAL This chapter describes DTE interface options that may be required if application requirements change. It also describes software configuration for the T1 interface card. Installation Guide 10/100 Mbps LED (amber color ) Link/Activity LED (green color ) 1. Introduction Thank you for purchasing this 1-port RS232 to Ethernet Adapter (hereinafter referred to as Adapter ).